The BBC has dedicated an article to Georgian medieval monasteries that are now on the territory of the neighboring country, Turkey. “Turkey’s Forgotten Georgian Kingdom” is the name of the article, which explains that the ongoing governmental disputes between the two states have left the fate of the medieval architectural wonders in limbo. “A rugged, remote area where unforgiving rocky crags give way to green oases, north-east Turkey is home to magnificent Georgian monasteries from the medieval principality of Tao-Klarjeti, a former feudal state ruled by the Bagrationi royal family,” the article reads. The authors of the article, Katie Nadworny and Emma Harper, explain that Tao-Klarjeti was once a part of the United Kingdom of Georgia that thrived during the 12th and 13th centuries. However, repeated incursions by the Turco-Mongol conqueror Timur in the late 14th Century led to the demise of the kingdom, and in the mid-16th Century, Tao-Klarjeti came under Ottoman rule, which led to it becoming a part of modern-day Turkey. “During the kingdom’s golden age, Tao-Klarjeti was the center of monastic life governed by the Georgian Orthodox Church. Today, striking remnants of the principality’s spiritual influence remain tucked in tiny Turkish villages among the visually arresting Kaçkar Mountains near the Turkey-Georgia border,” the article reads. The authors say that Oshki Monastery (963 – 973 AD) in Erzurum Province, one of region’s grandest Georgian Orthodox sites, is in danger, as the expansive, cruciform-shaped monastery is now mostly roofless, though the open sky emphasizes the splendor of the soaring central dome. 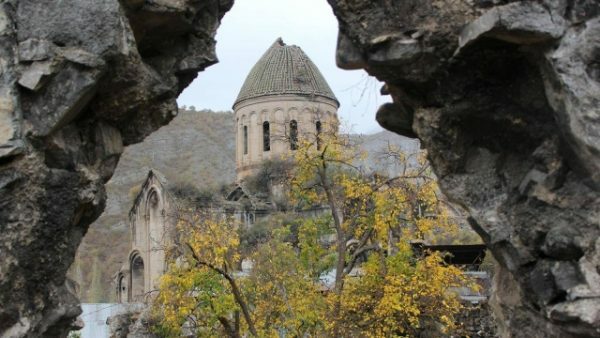 “Disagreements between the Turkish and Georgian governments on how to proceed with restorations have left the monastery in a state of neglectful limbo, and the majesty of Oshki is left open to the elements, crumbling slowly,” the article reads. The article says that Ishan Church near the village of Arpacık, first mentioned in a Georgian manuscript in 951 AD, has suffered a fate worse than neglect: a haphazard restoration. “The sandblasted stone exterior belies the building’s age, while the large, smooth, square-cut stones – some a glowing white and others a perky pink – look more modern than medieval. Crowned with a brand new, yet uneven, red-tiled roof and bordering a carelessly excavated archaeological site, the church reveals the slipshod approach to preservation that is so prevalent in this region,” the article reads. As for the Dörtkilise church from the town of Yusufeli, the images of the Orthodox Christian saints have faded over time and the white walls beneath them are desecrated by graffiti. “Meanwhile, the slanted floor littered with debris lends credence to the claim that the church has most recently been used as a barn,” the article says. The authors stress that with no cohesive preservation plan in place, the fate of these architectural wonders remains uncertain.